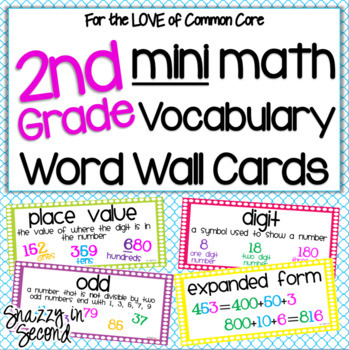 This set includes over 160 vocabulary words for 2nd grade math units! Vocabulary words are at the top of each card. Most cards include a definition and a picture or graphic. These cards are the perfect size or your word wall. They are 5 inches long and 2 1/4 inches wide. 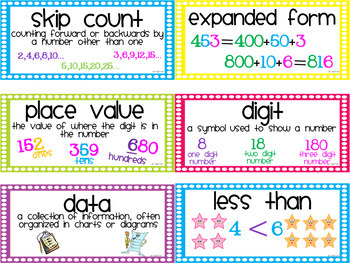 word form, number names, category, interpret, equal, comparison, a.m., p.m., customary system, metric system, cent, key, line plot, one hundred, unit, addition sentence, subtraction sentence, decimal point, flat surface, half dollar, half past, pictograph, pyramid, subtraction sentence, tally mark, triangle, square, parallelogram, unequal, square, triangle, parallelogram, operations, part-part-whole, join, combine, separate, related facts, unknown, total, less, greater, base ten, thousands, hundreds, pair, least, greatest, order, symbol, value, coin, dollar sign, partition, eighths, rhombus, length, yard stick, meter stick, area, minute hand, quotient, data, midnight, noon, equal parts, fewer, number sentence, and pattern. Love what you see? Click the Follow Me button next to my picture. • Log in and go to your My Purchases page. Click the Provide Feedback button next to each purchase. You will be directed to a page where you can give a quick rating and leave a short comment for the product. Each time you give feedback, TPT gives you feedback credits that you use towards your future purchases. I greatly value your feedback on my products. © 2018 SNAZZY IN SECOND. 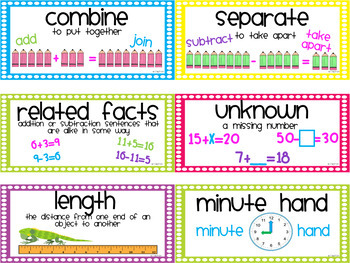 This purchase is for you and your classroom. Duplication for an entire school, an entire school system, or for commercial purposes is strictly forbidden. Please have other teachers purchase their own copy.